Audience tweets from our cinema relay of Verdi's epic opera, starring opera legend Plácido Domingo. 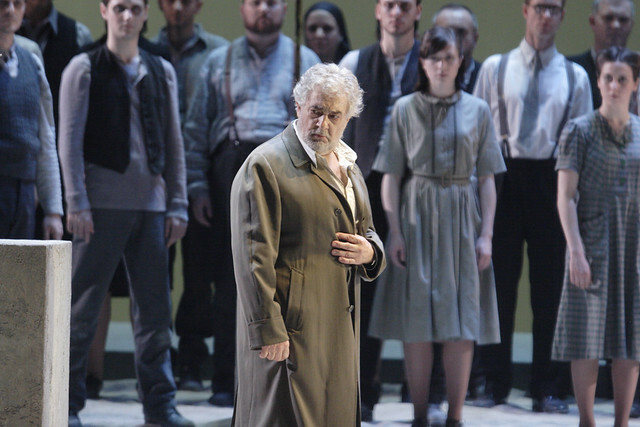 Your tweets from our cinema relay Verdi's epic opera, starring opera legend Plácido Domingo. What did you think of Nabucco? I cannot but agree! He is THE Grand Master. Placido Domingo goes from strength to strength-I find his contribution to the opera world-and music in general-remarkable, and is truly a star eclipsing the stars. His performance in Nabucco was a tear jerker. The duet with Liudmyla Monastyrska rivetting. We are fortunate that he can still gives us his all. Magnificent singing and acting in Nabucco. The cinema was full - so obviously popular and people were so engaged they were clapping along with the live audience. Is anyone in government understanding that, with reasonable access and cost, opera is not just for the minority? We saw it live at the ROH on one of the evenings that was recorded for the cinema relay. The performances were outstanding - we were particularly impressed by Liudmyla Monastyrska's powerful Abigail, but really they were all fantastic - the chorus, orchestra and conducting were all superb. It was therefore sad that the sets and costumes made the whole thing hopelessly confusing for me, so that I really struggled to know who was who or where they were supposed to be a lot of the time. Fantastic to be able to see it all over the world in cinemas. Thank you ROH but hopefully ROH and other opera houses will get the message that the audience hated this production and will stop paying ridiculous fees for such poor productions. Without Plácido & Liudmyla it would have been terrible. The Chorus & Orchestra and the rest of the cast did a great job as well. Such a shame that a director can ruin such a beautiful opera. A production of sophosication and power that some minnows in the press couldn't be expected to appreciate. I'm delighted to have caught this version of Nabucco in the cinema where you can see snd hear much more than in any opera house. The voices and acting were up there with the best ever. I wasn't actually looking forward to this as Nabucco hasn't been a favourite of mine, but from the overture onwards I was enthralled. Thanks ROH. Sophistication? Power? I saw neither. Quite good to look at and quite inoffensive, but undramatic and confusing. Yes everyone out here who loves Good Music, finest Entertainment must like to see this Opera!!! Everyone can´t go to Metropolitan or Barcelona etc....Good Music and Good Artists will bee seen even on a Screen. I have done it sometimes! And it´s just Lovely and we have a nearness with details never seen Before! Ohh this will be GREATER THAN GREAT!!! I just love thet Artist, as Human too... Hes my absolute Favorite!!! Voice and Smile = Placido Domingo! Domingo is God! I was so lucky to meet him live at the ROH, and then again with the HD version! And so did we !!!! We totally agree for >300 % ! Now looking forward to a DVD of these stunning performances. Thank you ROH !? Having seen a disappointing performance in the theatre (1st April) I went to see the cinema performance, which I found totally absorbing thanks to Domingo and Monastryska in particular. The production I found even more confusing than in the theatre as in the close ups you really could not see much difference between Hebrews and Assyrians, (even the subtitles did not work for the first 15 minutes) . The back projection was unnecesary and just added to the confusion. I thought Domingo's interpretation was far better than Nucci , both vocally and dramatically. Monastryska is just sensational ( there were echoes of the great Elena Souliotis back in 1972)and all the other singers sounded much better than in the theatre.. The chorus was superb and all in all it was a very satisfying musical experience in the cinema! I also found it much more affordable in a better seat!!!! Placido Domingo made me feel ALIVE !!! Can we have this on DVD please? Stunning. Domingo was absolutely superb,what a wonderful performance. All the soloists were wonderful, but Domingo was exceptional - his acting and his superb singing, he is a Master of his art - and the chorus were also inspiring, and it was so nice to see and meet some of them before the opera started. My only adverse comment is the set which was awful, it added nothing to this lovely opera, why not keep to traditional sets ? I admit I am a traditionalist and hate modern sets - it's the set that helps to make the production a total experience.Overall a wonderful opera and the explanation by Pappano was just right, and set the scene, as it is several years since I had seen this opera and had forgotten some of the plot. Loved it - but the Odeon South Woodford had no subtitles for the entirety - was it meant to be like that? A little elitist I thought as my Italian is not up to much! Certainly should have had subtitles! Occasionally cinemas have technical problems, although we do provide test events for them to check their receipt of our stream and elements such as subtitles. Amazing production! Domingo and Monastryska were both exceptional... and so was the conductor Luisotti. Enjoyed every moment despite the lack of subtitles at the beginning! Loved the contrast between the simplicity of the set and costumes and the force behind the acting and the voices. The whole essence of Placido Domingo creates positive energy for full audiences. His voice is giving more than enough for everyone. Stunning at the ROH in April. Even better tonight on Radio 3. Cinema in France later in the month. We will all be poorer when he is forced to settle for conducting. please, any chance of purchasing a DVD of this production? I would love to be able to watch this many times over the coming years. Absolutely beautiful..